It only seems a few posts ago that I was drawing attention to a sale at Mongoose Publishing. This one is much better because it's packed with Runequest goodies on DriveThruRPG (so it's mainly PDFs). Now I know there's a few of us who have been away from Runequest for a while, so we find the edition numbers a bit confusing. For me, this was not a new experience. 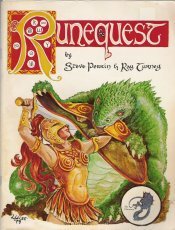 After years of not understanding adventures in magazines I discovered that I actually owned one of the earliest flavours of Runequest (Chaosism - colour cover) - I'd guessed that it had preceded a new boxed edition (RQIII) - I'd picked it up cheap, possibly secondhand at Games Workshop in the early 80's, come to think, it was probably my first role-playing hardback, durable with illustrations by Luise and a character sheet at the back which looked like it had been designed on a typewriter. Everything I've read online lists edition numbers in the most random way. I thought I owned RQ1 (reprinted ... or at least 2) - perhaps I should say I own RQ "minus four". Months ago I found a definitive list of all of the editions to date and links to an open source document, I can't find it tonight because my search-fu is weak tonight. The low POW roll means I expose myself as an amateur acolyte. One of the most noticeable set of rules which differentiated RQ from D&D (apart from RQ's Glorantha being more "classical" and less faux-medieval in setting) was the hit location rules. Magic aside, and no levels, it was the hit location rules, critical damage, fumbles and impaling in combat made players assume it was somehow more "realistic" than D&D. I believed that hit location rules and HP distribution were invented entirely by Chaosism/RQ. This gaming myth was shattered last year when I finally saw the rules supplements for OD&D "Hit locations during melee" - (page 7 in Blackmoor) it's all very familiar, but somehow never made it into AD&D. Anyhow, I'll stop babbling now. I have to commune with my house spirits. I had the same WTF moment a few months ago on my first reading of Supplement II: Blackmoor. Now I keep wondering what would have become of D&D and AD&D if that had made the transition.